Brand: Savinelli Model: Miele Honey Style: 642 Shape: Bent Apple Length: 5.13 in. / 130.30 mm. Height: 1.51 in. / 38.35 mm. Weight: 1.89 oz. / 53.58 g. Bowl Depth: 1.21 in. / 30.73 mm. Bowl Outside Diameter: 1.62 in. / 41.15 mm. Bowl Inside Diameter: 0.79 in. / 20.07 mm. 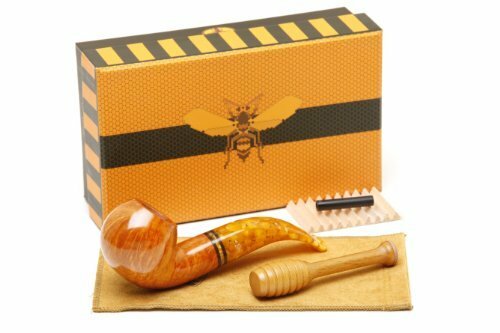 Filter: 6mm Finish: Smooth Bowl Material: Briar Stem Material: Acrylic Package: Box Country: Italy Convertible: Yes Includes: Hive Tamper *Pipe measurements are approximate **Pipe pictures are not of actual pipe you may receive.